You are here: Home>Archive>Taylor Brown Collection.>Marriages.>GPO Greetings Telegram from Walcot to Mr. and Mrs. Brown. 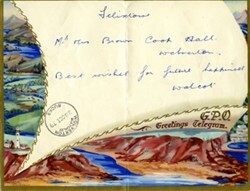 GPO Greetings Telegram from Walcot to Mr. and Mrs. Brown. Greetings Telegram to Mr. and Mrs. F.H. Brown from Felixstowe saying ‘Best Wishes for future happiness Walcot’ . The telegram is on pale yellow paper with gold coloured borders. On the left and at the bottom of the telegram are pictures of landscapes and an estuary. It is stamped with the date 28 Oct 39.